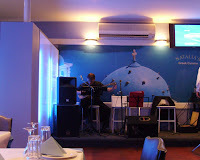 Sitting within Natalia's blue-and-white interior feels a little like being underwater; it certainly doesn't sound like it though, as chatter from the predominantly Greek crowd competes with the live bouzouki music. This is not a restaurant for vegetarians: the menu is divided in entrees (all seafood), appetisers (some of which are meat free), seafood and mains, all of which are meat based. While the $20+ price tag on most of the mains seemed a little high, it was offset somewhat by complimentary additions to the meal and the size of the portions (though surely it's preferable to have the option to be served less and pay less). A banquet is also available for $39 per head. First to the table were two huge baskets of bread. It smelled wonderful and while it was a little too loafy to be an ideal meal accompaniment it's impressive to know that it's made on site. 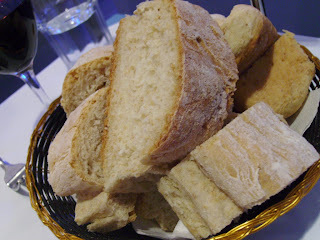 The bread came with our first appetiser, melinzanosalata (try getting that out correctly first time! 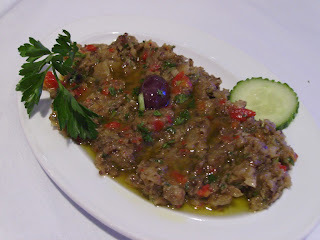 ), an earthy-green blend of eggplant, capsicum, garlic and olives. 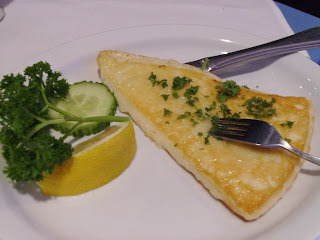 Alongside came a triangle of grilled saganaki, wonderfully firm and salty, with the centre just slightly melted. A main serve of deep-fried calamari was ordered as a joint entree for four. 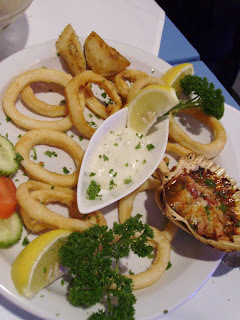 The calamari had been properly cooked, retaining texture without being rubbery, and had just the right amount of batter. For $22, however, one might expect a few more rings, the bonus to the right of the plate notwithstanding - a scallop a la Natalia, served with worcestershire sauce, spring onion and bacon. Where the calamari had been so simply adorned, however, this dressing rather overwhelmed the mollusc. And so to the meat. 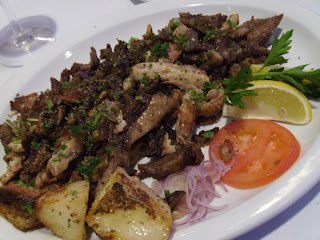 For the men, a meat platter for two; for the ladies, two plates of kleftiko: lamb and chicken cooked over charcoals. Firstly, to the positives. All the types of meat had been cared for: lamb and chicken were decadently oily and as the diced pieces dissolved in the mouth they released loads of flavour. The potatoes that accompanied the meat were superb: laden with herbs, salt and oil and still soft and fluffy; a plate of potatoes plus the calamari would have made for a satisfying repast. 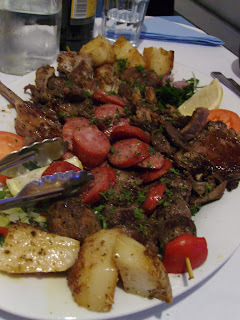 The skewered meat on the meat platter was particularly enjoyable and there was certainly an ample quantity. There were also some negatives, however. Both plates of kleftiko arrived not cold, but tepid at best. These were willingly replaced. The cutlets on the meat platter were a little dry, though with so much carnivorous material to choose from this was not a big issue. A massive bowl of Greek salad, at $6, represented excellent value for quantity. The quality wasn't quite so impressive, however, as it mainly featured lettuce and an acidic dressing, with a smattering of feta and the occasional olive. Nevertheless, more positive was to come. Once the main dishes had been cleared, after all best efforts had been made to do justice to the portions, an unbidden, but very welcome, dessert arrived. 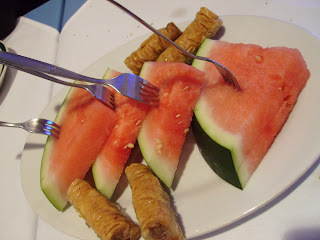 Watermelon was the perfect antidote to all that carb and protein, but the sweet tooth was also sated, with the provision of gooey cigarillos of baklava. The restaurant offers the welcome mix of being BYO, with no corkage, and licenced (and they stock Mythos beer, very handy for pretending one has escaped to the Mediterranean). The service was more comfortable amongst the Greek speakers, but it was attentive and friendly. Despite a couple of communication issues the staff strove to accommodate our requests (though the plan for a three-stage meal was scuppered with the concurrent arrival of calamari and meat), and while it was peculiar that spit roast meat could arrive at the table less than piping hot, they were sincere in rectifying the problem. I have been to Natalia's 3 times and keep going back. Food plus entertainment is fantastic and I keep recommending Natalia's to all my family and friends. You must go and try. It's the best. Ayfer. I'm afraid I can't agree! I have been to many greek restaurants and I must say Natalias is one of the worst. Our dips came out rock hard as they were still frozen and the meat was cold and much too salty! The greek salad isn't bad if you pick around the brown bits of lettuce. When we complained staff were rude and unaccomodating! I wouldn't bother, spend your money elsewhere guys! That doesn't sound like a good experience - frozen dips is not a good start. I agree the Greek salad could use some work. We've had our issues with the staff, but I will say they've tried to be helpful, whether or not they've succeeded in that. Better luck for your next dinner out! We were so disappointed! My female friend was harrassed in the patron carpark by over zealous staff reserving their parking for their regular customers, we were overcharged for house wine the menu listed it as $6.50 and we were charged $10.00 a glass and told it was for the band, why not just charge us for the band, don't try and rip us off! There was clear inequity with service as their regular customers recieved clean plates between courses whilst we were ignored. To top it off there was an overwhelming smell of toilet freshner throughout the restaurant. The toilet gushed water all over the floor continually. Never again! This place does not seem t o pride themselves on freshness. I attended this Restaurant late last year with my partner and found the staff very unhelpful the music was too loud the ambience was terrible and the decor poor. I persnally did not think for a minute that I was in greece. We ordered dips for entree which were still frozen. Complained and the waitress advised that they were fresh, NOT!!!!! We ordered a seafood platter and that was a shock even my 4 year old daughter could put food on a plate better than wat the food was presented to us. I called over the waiter and advised that where is the seafood nice and bright which was badly arranged on the plate and all been defrosted no freshness at all. I would not recommend this place at all very disappointing and very overpriced and the service was terrible. Ohh lucky i found this, was going to book a big function!